Leadership can be an intimidating topic – for people of all ages, in all professions, at all levels to include executives. A frequent question I get from people looking to become a better leader is simply: Where do I start? I have some ideas on that subject. Throughout my military service, I was most impressed and inspired by those leaders who were honest in their own efforts to learn and who helped me do the same. Learning how to improve my leadership skills was a very natural task for me. And I learned how to make it fun! These last five years in the civilian world have exposed me to the fact that learning to lead is not so natural for many. Leadership is a process of influence which means most of us are leaders, regardless of our job title or role we have in life. My recipe for success in learning how to become a better leader has three basic steps. If you are interested in learning more, read on! * You must commit to learning. Successful leaders do not drift to greatness – they are tireless in pursuit of learning. Think about how much time professionals devote to learning technical skills – such as a physician, nurse, athlete, musician, educator, accountant, coach, writer, or an engineer. 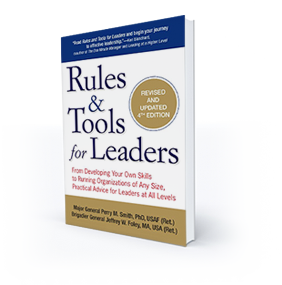 A commitment to learning leadership skills is equally important – and often neglected. Learning requires time and focused energy. To improve your ability to lead others, you simply need to get your head in the game and commit yourself to that task. Once you are committed, you are ready for step 2! * You must know yourself. Knowing yourself requires understanding who you are and how you act. Being a better leader begins by being a person of character which sets the conditions for building trusted relationships with others. Do you know who you are and what you stand for? Do you know what values you deeply believe in and what they mean? A marvelous free tool that can help you define your personal values can be found on the website: http://integrityconsulting.ca/resources. I used this site recently to complete an updated version of my own values – it was a rewarding experience. Becoming aware of your behaviors – strengths to exploit and potential challenges to address – is a critical step in developing and refining your leadership skills. Soliciting feedback from others you trust is a great way to help you gain clarity on your strengths and challenges. This also requires some courage. A more formal way to learn more about yourself is through a personality/behavior assessment. There are many valid, research-based assessments that provide valuable insights into your behavior tendencies, strengths, and challenges. I have taken a variety of assessments over many years and they all helped me. Growing up as the youngest of 6 kids in a blended family, I assumed the role of peace maker. These tools helped me understand the impact of this behavior preference. Millions of people using these assessments every year. Only when you are able to understand “you” will you be able to discover and bring out the best in others. Gaining a clear picture of who you are is key to moving on to step 3. * Develop and implement an action plan. It is now time for action – deliberate action. This is the real challenging part of your leadership journey – for it demands a focused effort to document those behaviors you want to sustain and those behaviors that you need to improve. Use the information from step two to prioritize your top strengths and opportunities for improvement and develop your action plan accordingly. Identify a measurable goal and the specific actions required to accomplish the goal, with a clear end date for completion. 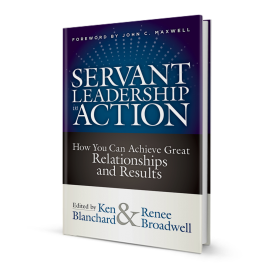 Ensure you identify those leadership behaviors required to achieve this goal. There are plenty of free “action plan” templates available on the web – just choose one that is simple. The key is to write it down, be specific, and have others help hold you accountable for execution. When you achieve your goals, celebrate accordingly! Then develop your next plan!! Becoming a better leader is a journey. I wish you the best!